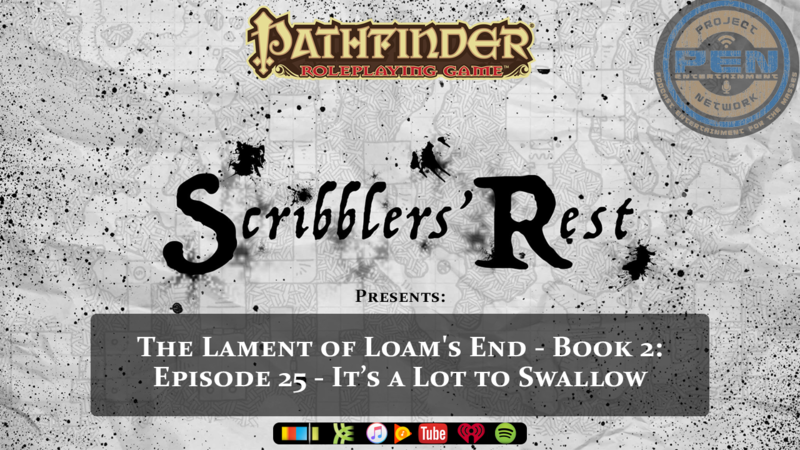 Scribblers' Rest: Scribblers' Rest: Episode 25 - Pathfinder - The Lament of Loam's End - Book 2 - It's a Lot to Swallow! Scribblers' Rest: Episode 25 - Pathfinder - The Lament of Loam's End - Book 2 - It's a Lot to Swallow! The Scribblers continue their adventures with the Firm Hand Mercenary Guild in Loam’s End: Book 2, Episode 25 – It’s a Lot to Swallow! The cult of the Sea God is missing a corpse, and there are some pirates coming to town. We're off to a wild start as Dee Jay's nutsack hits the table and the Bishop comes in.